As one-to-one (1:1) classroom (every student has his/her tablet or laptop, such as iPad or Chromebook) is gaining popularity, more and more benefits of this form of ubiquitous access to technology have been recognized by educators as well as students. Discernment of subject during earlier days or in traditional approach, did not involve the use of technology. The teachers lecture all students in the class regardless of readiness levels or learning styles. The students always find it difficult to harmonize with the teaching styles of different educators. The pace was difficult to match; still students were expected to learn the material of the scheduled modules presented by the teachers assigned by the authorities. The teacher was the major source to explain the information provided by the resource materials like encyclopaedias or textbooks. With the increasing use of Internet and other technology in education, students get tremendous opportunities to learn according to their own choice. The content delivery with 1:1 can be comprehended, through video, audio or activity forms. Technology allows learning content to be paused and viewed as many times as the students who feel the need to understand the topic. The student coursework and assignments can be given based on activities or creative ideas distinctively which was previously, assigned by one general assignment given to all students. Assignments can be differentiated or even individualized through the use of flexible technology that gets controlled or modified with previous students’ responses. For some teachers, preparation for 1:1 may take a long time and becomes a steep learning curb. You should allow yourself time to steadily adapt to the new technology. As expected, glitches and mistakes are unavoidable with the introduction of new strategy and tools in the classroom. Learning from failure is always the necessary step for success. As your comfort level increases in the new environment, 1:1 integration into your curriculum will also increase. There is no doubt that the 1:1 devices are not coming to replace the quality teachers and take over the classroom. Instead, the devices provide teachers and students a better way to connect, share and search information. Educators should provide necessary training and set up rules at the beginning. It is also important for students to understand although the devices provide them a plethora of information and potential answers; they should always use their critical thinking and questioning abilities to evaluate the results. Neither your class nor the students should become attached to the devices. 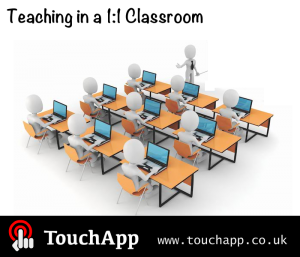 Teachers should feel confident to switch off the devices when not in use. The goal for modern education should never be 100% technology integration, but providing best possible resources and solutions to meet individuals’ learning requirement. Technology can help but the success ultimately lies upon every single teacher and student. School administrators should provide adequate professional development tiered by experience level. Teachers can certainly seek out technique advice from instructional technology coach and tech-savvy students can be an incredible resource for your 1:1 classroom. There are also plenty online communities and websites (such as http://www.edudemic.com) where teachers can learn from each other. You not only can get the latest information of the devices’ functionalities, but also be inspired by endless innovative ideas to use the technology creatively in your classroom. 1-to-1 programs could prove a fundamental change in the education system and an international step towards specified and defined learning, increasing independence and self-initiated curiosity about a topic in students, and enhance their learning by extending it beyond the classroom.